In which I show you how to wind electric-fence wire into small rings suitable for weaving into chain mail garments. There are many websites that will show you how to manufacture chain maille items, focusing on the different styles of 'weave' (how to combine metal rings together to make a protective and attractive garment) that you can use. Unfortunately, most of these guides assume that the reader already has a supply of suitable rings, and seldom guide the reader in creation of their own rings. While you can purchase pre-made rings from a number of places online, I wanted to make my own rings. This project is also documented on the Instructables website. A small pile of rings: Ready to be woven into a garment. A former roommate, modeling the Coif (hat) that I made back in high school. Our raw material is steel wire used for electric fences on farms and ranches. The wire that I found at the hardware store was made by a company called Oklahoma Steel & Wire. Since I purchased this wire probably five years ago at this point (around 2003), I think they have changed tag colors, as this is a 1/2 mile spool, not a 1/4 mile spool as the yellow tag would indicated (at least according to their website). We need a way to make this wire into small, consistent rings. We're going to build a machine capable of winding this wire onto a metal rod to make a long coil of wire. We will then cut individual rings off of this coil. Yeah, I dropped the spool a couple of times, and the plastic spool broke. This is the winder that was built, and is explained in the following steps. Using the materials we had sitting around in the garage, we used a piece of an old shelf for the base. Standard 2x4 pine studs were used for the rest of the construction. We used a 3/8" steel rod as our primary winding rod. A couple of bends were added to one end to allow it to be used as a hand crank. Be sure that the crank part extends off the edge of your base, as you don't want to be bashing your knuckles into the base with every turn of the crank. Later on, we discovered that the power drill could fit the rod into the chuck, and we cut off the handle so that we could run the winder at high speeds without danger. You'll need to drill a hole in each support for the winding rod. Try to get them aligned as best you can. The friction from the turning rod will wear on the wood a bit, and makes the bearing smoother the more you use it. To get the wire firmly anchored to the winding rod, we decided to drill a hole straight through the winding rod for the wire to slip into. This allows us to make a very tightly wound coil of wire. The basic idea is to crank the winding rod, and guide the wire onto the rod directly adjacent to the rest of the coil. Initially, we used hand-cranking, with hand guided wire. Eventually, we upgraded to using the power drill for winding, and created a pretty cool winding tool that will be explained in the next step. The washers you see at the left are used to offset the coil from the support post. When winding, you will need to keep pressure on the winding rod so that the wire through the hole is pushing on the washers, which are then pushing on the support. A finished coil. Normally they are much longer. Our winder can make coils that are about 12 inches long. A major problem with trying to wind too fast, such as with a power drill, is that it's very hard to guide the wire by hand. The difficulty comes from the fact that you're trying to keep the new wire right next to the existing wire coil, without getting gaps in the windings, or overlapping the already-wound coil. To facilitate high-speed wrapping, we created a tool that greatly reduces the error rate when winding at high speeds. We started with a piece of 1" diameter brass barstock laying around the scrap pile. We first drilled a hole just slightly larger than 3/8". Remember that 3/8" is the diameter of our winding rod. The extra size is to allow the finished coil, which is slightly larger than the winding rod, to fit inside the winding tool. We also drilled a small hole perpendicular to the main hole, which is for the wire to feed into the tool from the spool. See the attached images for a diagram of the two drill holes in the tool, and also a rotating 3D animation of the bar, to fully illustrate the construction. As shown in the bottom image of the diagram image, you feed the raw wire in from the top, which is then wound around the winding rod. The finished coil will grow out the side of the winder tool. This winding tool solves the main hand-wrapping issues of gaps and overlapping quite nicely. It allows you to put solid pressure towards the washers and the completed coil, which eliminates gaps in the coil. Since the winding tool is tight around the finished coil, it's not possible for the wire to overlap the finished coil, as there is no room inside the winding tool. Using this tool, we are able to easily wind a complete 12" coil with the electric drill in under a minute, without worrying about the quality of the finished coil. 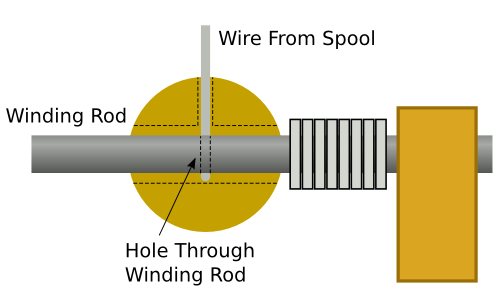 Details of the winder tool's construction. 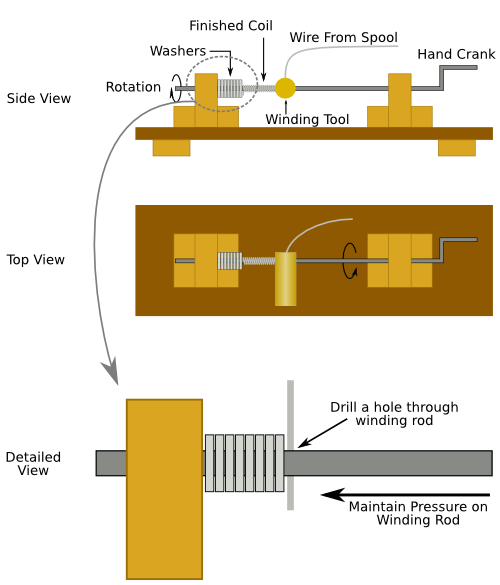 A rotating image to further illustrates the winder tool's construction. Having described the construction of the chainmaille winder, I will now describe how to use this tool and stand to create perfect coils of wire. A quick note: These pictures were taken a few years after I stopped doing chainmaille very much, so my 3/8" winding rod had gone missing. I substituted with a smaller winding rod. Also, I couldn't find all of my washers, so I only have one washer in the pictures. Normally, you'll want to have a few more washers than pictured, although a single washer will work. Also, I couldn't find the brass winding tool anymore. The next few steps will describe how to wind wire coils without the winding tool. First, start out by cutting a length of wire from the spool. Try to straighten the wire, as it will be all coiled up from the spool. You can see in the pictures that I am wearing heavy leather work gloves. This is a really good idea, as fast-moving wire can cut your fingers, and the sharp ends of the cut wire will cut your skin if it rubs you the wrong way. Feed the wire through the little hole, and leave some wire hanging out the other side, at least 1/2" worth. In this picture, I've left about 2" hanging out, but you don't need to leave quite that much. 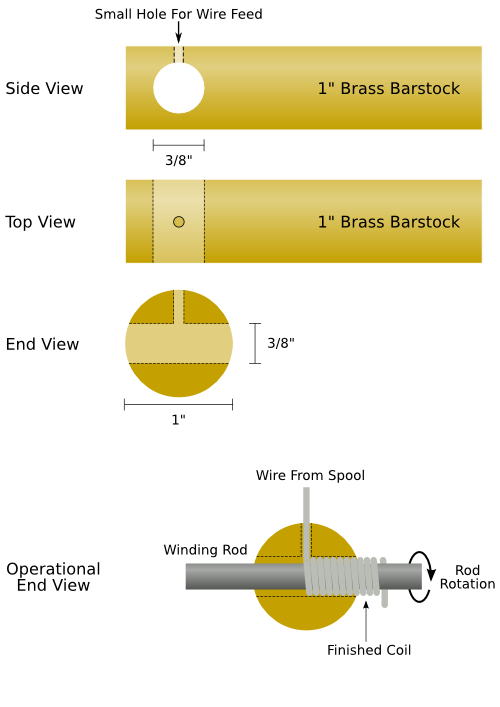 See the included image for a depiction of how to start winding with the brass winding tool. Basically, you need to insert the end of the wire through the small feed hole in the winder, and align it with the hole through the winding rod. Once you feel the wire slide through the winding rod's hole and hit the other side of the brass winding tool, you can start to turn the winding rod by hand, which will wind a small coil of wire. Once the coil has emerged from the side of the winding tool, feel free to attach the electric motor/drill and start your high-speed winding. While maintaining pressure to the left, towards the washer(s), have your friend slowly crank the winding rod while you feed the wire on the rod. In these pictures I'm not using the winding tool, in order to demonstrate the overall process. Keep cranking and winding until you run out of wire, or you reach the right-most end of the winding rod. Feed the wire onto the shaft. Finished winding. Normally you use more wire than this. Once you have finished winding, you need to cut the coil off the winding rod. To do this, we used a diagonal cutters. You want to cut the wire right where it enters the pilot hole in the winding rod. Slide the winding rod to the right, and slide the coil off the end of the winding rod. Slide the coil off the shaft. Many coils of wire, ready to be cut apart into individual rings. Having made a big pile of coils, we now need to cut them into individual rings. I have heard of people using tiny jewelers' saws, but we don't have one of those, so we just use a diagonal cutter. Cutting off the individual rings. A small pile of finished rings. Having created a bunch of rings, you are now ready to weave a chainmaille garment. Others on the internet have already done a good job explaining how to weave rings into maille, including the highly efficient "speedweaving" technique. I'd suggest searching for "European 4-in-1" as a weave style, or check out this Instructable.